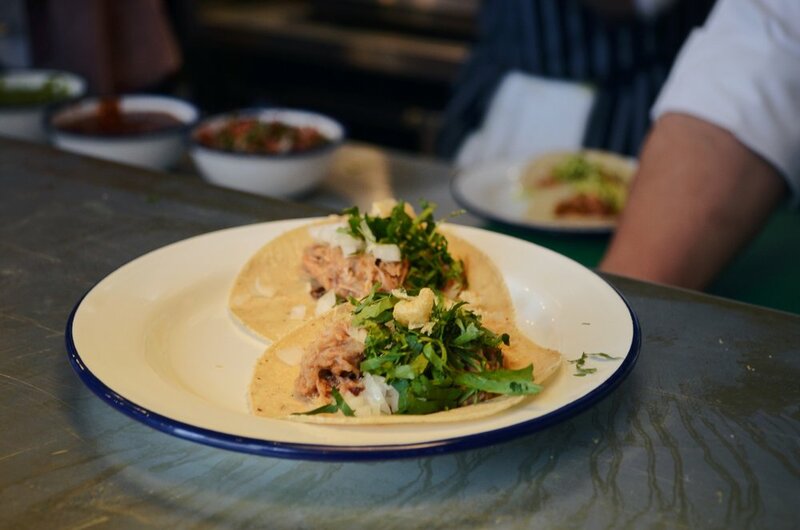 Mexican food has experienced a heyday in London. No longer will a bag of triangular chips, suspiciously ressembling Doritos, heaped with luminous melted cheese and undefined 'salsa' suffice. 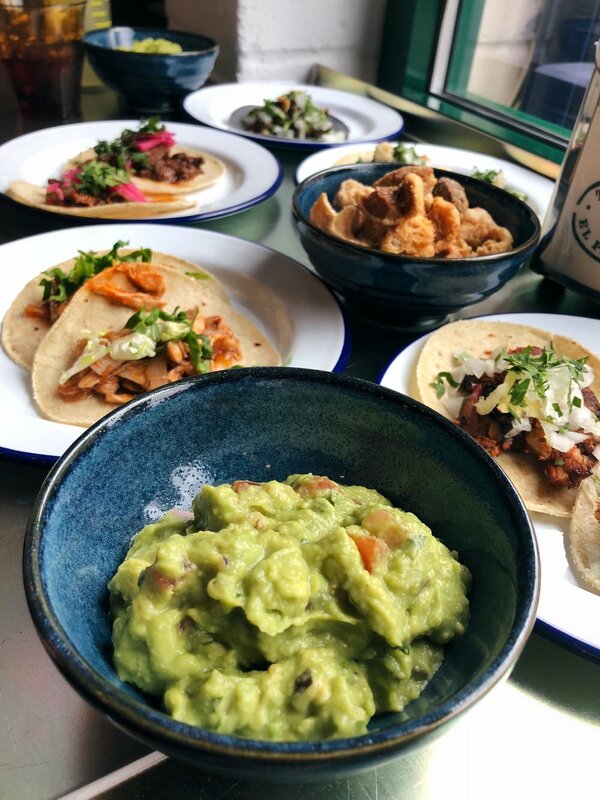 No, Wahaca has educated the masses and we have come to know and love the fresh, simple ingredients layered to provide a variety of dishes bursting with flavour. And now, with the opening of Tortilleria El Pastor, London has another fun Mexican spot to add to its repertoire. Tortilleria El Pastor is small, but ambitious. It's a tortilla 'factory', bar, restaurant and shop - all in a space that seats 26 total. I rocked up less than an hour after the restaurant opened for its soft launch and already the queue was snaking out the door towards Maltby Street; not hard given the size of the place, but still testament to the reputation that the original Tacos El Pastor has established. I joined the queue, the cynic in me suspicious of this being a matter of hype and no substance, already drafting excuses to my sister who had been dragged along after she unwittingly suggested we get lunch this weekend. Lucky for me, the new tortilleria did not disappoint. The team have most definitely realised their vision to deliver great food and service, without stifling fun and creativity. Mexican tunes from the old-fashioned radio drift above the excited chatter, interspersed with rapid fire order numbers shouted out for collection. The decor is simple, in keeping with the trendy vibe and the vibrant posters pasted around keep the space fresh and relevant rather slipping into yet another exposed brick wall and steel counter topped cliché. It is the epitome of feeling casually unconcerned, while having had every detail carefully turned over. With a finely tuned, shortlisted menu the kitchen operates with ruthless efficiency and the queue moved quickly. Given full control of the food while my sister snagged us seats, I tactically chose to share, ordering two of everything, including the two vehicles to scoop up the guacamole - normal chips and deep fried pork belly. It was the correct decision. I'm not sure what my favourite taco dish was, as they were all sublime. Maybe the namesake Al Pastor, where you can see the 24 hour marinated pork shoulder complete with caramelised pineapple rotating behind the service counter. Or the chicken marinated in a chipotle-cumin adobo, so succulent I had to negotiate hard to receive my fair share. Perhaps the carnitas of rich confit pork, crispy pork rinds and coriander. Alternatively the slightly charred, sweet and salty short rib guajilla rubbed pork with salsa La Maya. Essentially every plate except the one with cheese on, as I don't like cheese, was in the running for top dish and had I been alone I would have rejoined the queue to re-order the same again. We opted for the Karma Cola soft drinks Lemony and Gingery, because we are suckers for the retro-cool labels, but had the sun managed to peek through the drizzle the Mezcal, Mexican beers or frozen margaritas would have been calling our names. Alongside the restaurant menu is a range of high quality ingredients and produce needed to recreate the magic back at home. As well as using their specially imported tortilla machine to prepare fresh heirloom maize tacos every day for the restaurant, us mere mortals have been granted the chance to purchase these along with items including jalapenos, tomatillos and cheeses. And if that wasn't enough to continue the party, you can throw in a bottle of Mezcal, made in partnership with Mexico’s La Clandestina mezcaleria and El Pastor's first batch. 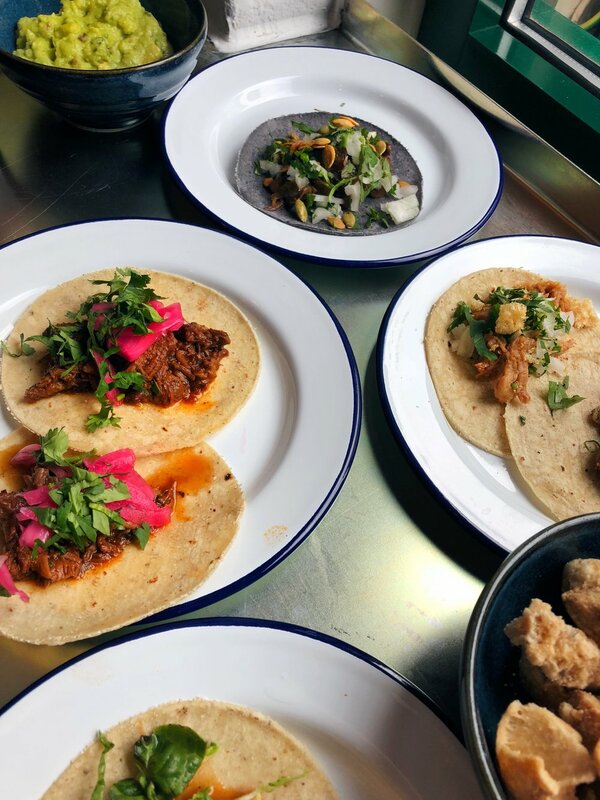 Tortilleria El Pastor can be found serving up tacos and Mezcal at 58 Stanworth Street, just off of Maltby Street Market / Druid Street, officially opening Friday 13th April 2018.